« What Not To… Eat? Ok, so everyone knows that mini-golf makes a great cheap date. It’s a lot of fun, doesn’t cost much and is a nice variation from the traditional dinner date. 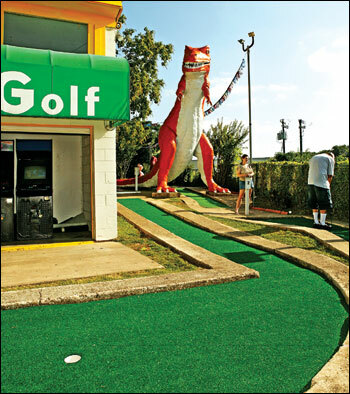 Peter Pan Mini Golf offers an Austin twist to mini golf with it’s tuxedoed pig and giant orange T-Rex. Hours vary, but Peter Pan is usually open till midnight. The price is $5 for 18 holes or $7 for 36 holes, and with a McDonalds right next store, you couldn’t ask for a cheaper date! Again! Another about Austin I have yet to experience! I’ve been wanting to go here for awhile now but everytime I have a chance to nobody else can go. Hey, let’s convince Seth that we should all go here to celebrate the end of the semester!